As often mentioned earlier on Icelog a group of Landsbanki Luxembourg clients have been trying to attract the attention of Luxembourg authorities as to the nature of the bank’s operations and to the handling of the bank’s administrator of their cases. Contrary to Icelandic authorities and the Landsbanki winding-up board, busy investigating the bank in Iceland and charging/suing its managers, Luxembourg – the tiny country dwarfed by its towering financial sector – has shown no appetite for any such undertaking. Now there are two new and very different developments which might be of interest for the Landsbanki clients, all of whom are foreigners, mostly elderly people, with properties in France and Spain. Labour MP Huw Irranca-Davies has drawn attention to the Rotschild bank, which also sold equity release products, causing default and loss of property, to a similar group of clients. And creditors in the long failed Luxembourg bank, Bank of Credit and Commerce International, BCCI also, like the Landsbanki Luxembourg clients, think that Luxembourg authorities are difficult to deal with. Interestingly, conservative Treasure minister offered to raise the matter with counterparts in Spain and Guernsey. Should he do that someone should tell him not to leave out the Landsbanki Luxembourg cases since they also concern equity release loans. One aspect of the equity release loans is that they have been sold by banks not operating in the country where the products have been sold. Rothschild, Landsbanki and several Scandinavian banks, all active in this business, sold the products to people in Spain and France, not from their operations there but from their Luxembourg operations. An interesting aspect, which has created a sort of vacuum around these operations: when the clients felt they had things to complain about Luxembourg authorities have not really listened as the products were not sold there; and authorities in France and Spain have so far not really taken the issue seriously since the banks were operating abroad. This case has shown that when it comes to unified European financial sector it only works for banks, facilitating cross-border operations. For clients and consumer protection this sector has as many holes as a Swiss cheese. A food for thought: if cross-border operations only work for banks and not for clients they should not be allowed. For anyone following the world of finance for some decades BCCI is a familar name. The bank was operating – yes, in Luxembourg for two decades from the 1970s. Founded in Luxembourg in 1972 by a Pakistani financier, Agha Hasan Abedi, it eventually failed in 1991 after financial regulators in several countries feared it was badly regulated. It took years to get the Luxembourgians to act but when they did it turned out that its operations were not only mundane lending and borrowing but money laundering and other criminal activities. One interesting aspect, in light of development in the three failed Icelandic banks is that the BCCI administrator, Deloitte, sued the bank’s auditor, Ernst & Young. The case never came to court but was settled for $175m in 1998. All of this has turned into a long saga, which quite remarkably is still ongoing. The latest is that some of its creditors are now fighting authorities in Luxembourg, claiming it is blocking money from creditors. Though the BCCI creditors certainly with deeper pockets than the Landsbanki clients, they are no less upset and do not intend to drop their case any time soon. One of them is dr. Adil Elias, whose story has earlier been told by the WSJ. Quite intriguingly the two gropus – the Landsbanki Luxembourg victims and the BCCI creditors – have one thing in common: both had cases ruled on right up to Christmas in Luxembourg and in both cases those complaining lost. Maybe a coincidence – or this is the time Luxembourg courts feel is the best time to rule on “unruly” bank clients ready to take on Luxembourg authorities. *See an earlier Icelog on this issue, with links to older coverage on Icelog. Wishing you all an inspiring and inspired year. 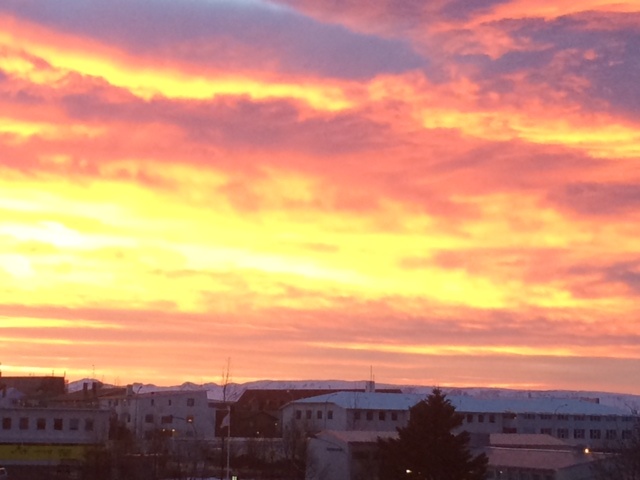 Here is the sunrise in Reykjavík today, just before the hour of sunrise at 11.18, on the first day of 2014. 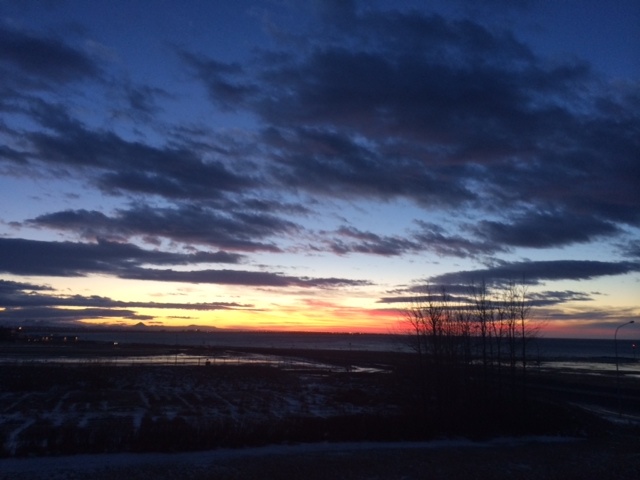 And here is the first sunset in Reykjavík on the first day of 2014, some time after the hour of sunrise, at 15.43. On New Year’s eve the custom is that the Icelandic prime minister addresses the nation and on the first day of the year, it is the turn of the president to have his say. And so it was this time. Both prime minister Sigmundur Davíð Gunnlaugsson and president Ólafur Ragnar Grímsson mentioned the Icesave victory, Gunnlaugsson though without mentioning the word Icesave. Our little country won a fair victory in a battle it had waged for years. Battle, where the opponents were big foreign countries and even international organisations but the allies few. We should though keep in mind the friendship that the Faroese and the Poles showed us already at the beginning of the painful passage. But early in 2013 Icelanders won a complete victory in the dispute concerning if the general public should guarantee banking debt where only the interest rates payments would have been greater every year than the running of Landspítali (the main hospital in Iceland) and actually more than double that cost because it should have been paid out in foreign currency that is not there. It is clear that the state could not have shouldered these payments but the cause of the steadfast small country won in the end and consequently it is now clear that everything that would otherwise have been lost could now be used to resurrect the Icelandic economy and at the same time the community that was so battered. We should also recall how the determined will of the overwhelming majority secured us victory in the bitter Icesave dispute. At the end of the day our position had the law on its side. It is notable how, both in the struggle to extend our economic zone and in the fight against the ghost of Icesave, it was national solidarity that paved the way for a just solution. The democratic will of the people rested on a firm foundation. The PM’s narrative is of the little nation that so fearless takes on injustice and mighty powers and wins. The president emphasised the value of solidarity and democracy. The Icesave outcome – a victory for Iceland – is a glorious example of how well the country fares when adhering to solidarity and democracy. His message is that Iceland will do well by sticking to solidarity and democracy in other vital matters. As so often, it is no less interesting to pay attention to what is not mentioned. Neither the prime minister nor the president mentioned that precisely because Iceland chose to let the EFTA Court settle the dispute Iceland is still burdened with the Icesave patrimony. Because of Icesave one of the three large banks, Landsbankinn, is now owned by the state, which consequently indirectly guarantees the bank. As explained in detail in the latest Financial Stability report from the Central Bank of Iceland Landsbankinn owes the Landsbanki estate (the operations of the failed Landsbanki) ISK297bn, €1.87bn, in two bonds. The payment schedule is: 2014 ISK17bn, €100m, then ISK60-74bn, €360-450m, the next three years, having then paid the bonds in full 2018. It is disputed how much is needed. The numbers flying around have ranged from ISK50bn, €300m to 200bn, €1.21bn. This does not mean the new bank doesn’t have the funds to pay. It does, but not in foreign currency: according to the FS report, almost 70% of the next three years’ payments, ISK157bn, is denominated in foreign currency. This is one heck of a problem to solve. In an ideal world, this debt would/should/could be refinanced. But refinancing is hardly viable as the government is, now and then, indicating that the creditors of the two other failed banks – Kaupthing and Glitnir – can’t expect to get their Icelandic assets paid out. And while the Icelandic assets are not settled their foreign assets are not paid out so as not the weaken the negotiating power of the Icelandic side though the Icelandic government is not a direct part in these negotiations. (More on capital controls here). None of this is any part of the victorious Icesave saga and thus was not mentioned in speeches at the end of 2013 and beginning of 2014. Nor did the prime minister mention at all the capital controls. He did however present a record spending on social affairs and healthcare in 2014, at the same time as no more debt will be accumulated – the budget should be balanced next year. And a surge in spending on cultural issues will be thrown in for a good measure and to sustain the often rather empty rhetoric about the importance of Icelandic culture. This is the tone at the beginning of the new year, not to forget that the president sees a new and decisive role for Iceland in forming an Arctic policy, the Arctic being a vital zone in the world. The prime minister ended his speech with poetic material from the 19th century, a much favoured source to add something serious to addresses such as the New Year address. European Union was not mentioned at all by the prime minister and Europe only mentioned to celebrate that the female soccer team made it to the European semifinals. The president only mentioned Europe in connection to other issues, nothing in his words about Iceland and the European Union. His little faith in the EU is well known as is his opposition to Icelandic EU membership. He did however remind Icelanders how every country in Europe had opposed the extension of Iceland’s “exclusive economic zone” – at the time generally talked about as the fishing zone – to 4, 12, 50 and finally to 200 miles. Russia’s desire to develop its good and longstanding relationship with Iceland with greater emphasis on the Arctic region came across clearly in my discussions with President Vladimir Putin in September; a view he had expressed to me on previous occasions. Neither the prime minister nor the president mentioned that there are now five years since the collapse of the Icelandic banks – and neither of them mentioned investigations against bankers and investors. Although these investigations are followed with great interest abroad and both men are keen on Icelandic fame abroad this is one fame both show little interest in. The next year will no doubt bring more news on investigations and charges – and most likely, although the prime minister did not mention it, some measures regarding the estates of Kaupthing and Glitnir. The government will only get one stab at finding a solution – a solution that must not undermine the financial stability of Iceland but at the same time it has to show the outer world that Iceland is willing to engage. The IMF program gave credibility to measures taken after the collapse. The new measures must as well induce credibility and that will not be easy of the rhetoric is all about battles and victory.